There are profitable opportunities for modern machine shops. Yet, a myriad of technical challenges hinder growth. This eBook looks at these issues and potential solutions. This eBook is of most value to leaders of machine shops trying to balance the adoption of new technologies with the potential disruption they can cause. Running a machine shop in today’s economic environment is no easy task. The margins are razor thin. Competition for a job might be located across town or across the ocean. Customers demand top quality yet require delivery on incredibly short schedules. The opportunities are there, but it takes highly skilled organizations to profit from them. 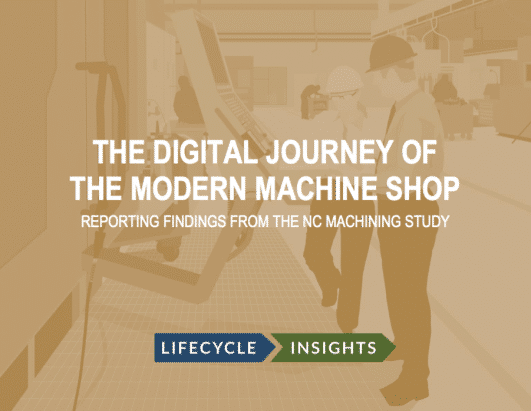 It is in this context that Lifecycle Insights conducted our 2017 NC Machining Research Study. Findings indicated that the dominant driver for any attempts to improve operations is Time-to-Delivery. However, a myriad of technical challenges undermines those efforts, ranging from high friction in the process of working with models, debilitating difficulty in creating toolpaths, unreliable verification of G-code, and low reuse levels of machining knowledge. Fortunately, many of these challenges can be addressed with the digital journey of the modern machine shop. The technologies that enable this digital journey allow machinists to seamlessly prepare and manipulate models from any CAD application, develop high quality toolpaths in an automated fashion, simulate the execution of the resulting G-code, and standardize NC knowledge for reuse across the entire process. The purpose of this eBook is to dive deeper into these issues. First, this publication formally publishes and contextualizes the NC Machining study findings. Next, it introduces an ecosystem of technologies that address the needs of modern machine shops. Last, it offers recommendations for next steps. There are many challenges in running a machine shop. However, use of the right technologies can make it easier and more profitable.